Tri-C JazzFest Cleveland is returning for the 36th year and this year's schedule is as awesome as ever. The weekend of entertainment comes to Playhouse Square July 9-11, featuring 9 ticketed concerts and two days of FREE outdoor shows on US Bank Plaza. Highlights of the festival include the Cleveland Centennial Celebration of Robert Lockwood, featuring Walter "Wolfman" Washington and Pete Escovedo Latin Jazz Orchestra featuring Sheila E. and Juan Escovedo. Tickets are on sale now, and you can snag a Festival Pass, which gets you in to all 9 concerts or you can purchase individual tickets online. Or, you can win a pair of tickets to see Pete Escovedo Latin Jazz Orchestra featuring Sheila E. and Juan Escovedo here. Before I get to the how to win, I want to tell you a little story. These are called cassette tapes. An old timey way of listening to music. Fashion was questionable. You had to go to the library and *look in books* for research papers. 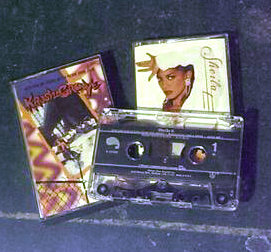 Mix tapes were cassette tapes. MTV played music. Prince was all over the place. I was a ridiculous Prince fan. The whole 9 purple yards. I couldn't get enough of his unique musical style and attitude. Out of all of his "proteges" Sheila E. was my favorite. I wore out my Glamorous Life tape. In fact, it was viciously devoured by my tape deck of my Pontiac Phoenix hatchback. One of my favorite pastimes was to go to record stores. Places that had records. You have not properly lived until you have experienced that second of anticipation, waiting for the needle to fall on the record...followed by a brief crinkly scratch and then track one. I could spend an hour in the record store, looking for new music - reading the liner notes. My aunt took me to Record Revolution in Coventry, forever cementing her as my favorite, to look for Solo Two, the album (yes, *album*) that Sheila E worked on with her dad, Pete Escovedo. There was no googling to download a track. No spotify. No pandora. Just flipping through racks and racks of albums. I saved my allowance and convinced my mom to take me to the see Prince and The Revolution and Sheila E at Richfield Coliseum. Concert poster from The Coliseum. I had tickets for the second night, which was in the middle of a vicious snow storm and there were rumblings of canceling the show. I begged and pleaded to still go to the show. 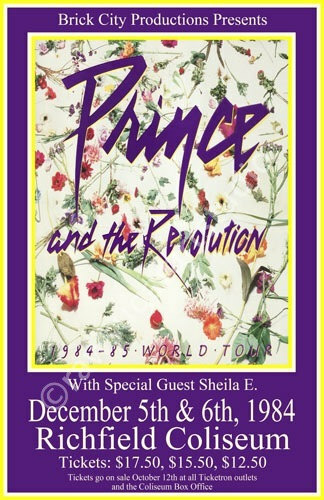 I loved Prince and I explained to my mom that Sheila E was a fierce percussionist and was completely unlike Prince's chick groups (a modern day comparison is Diddy and his Making the Band), and if we didn't go, my life would be ruined for all eternity. We trudged our way to the Coliseum, with blinding snow and much cursing. Sheila E. was on up first, and of course, killed it. Then came the break. I was chattering away loudly, my ears ringing from the speakers, when a man came over to us, chatted with my mom for a moment and said, "Follow me." From that moment on, things are blurry...both from age and excitement of the moment. I'm not sure how it happened, but we followed the man through concrete corridors of the Coliseum, people running around focused on their mission for the moment, until we ended up in a dressing room. "Wait here," was the instruction. I had no clue what was going on, and I plopped down in an m & m green chair chatting away questioning everything. Then chaotic noise, a commotion shuffled into the room and in walked Sheila E. It was one of the few times in my life I was completely and utterly speechless. I tried to open my mouth, but my words were replaced with little squeaks. It would have been impossible for Sheila E. to have been a nicer person. We chatted for a few minutes as a seamstress tried to sew her stage costume back together and then just as quickly, we were ushered out and back to our seats. The show went on to be one of my favorites, certainly my favorite from the Coliseum days. And yes, I owed my mom. BIG time. Sheila E. has never slowed down with her career and continues to make music. I encourage you to listen to an interview she did with npr, here. With Tri-C JazzFest, I want to send you to see Pete Escovedo Latin Jazz Orchestra featuring Sheila E. and Juan Escovedo on July 11. The rules are simple. Make sure you follow directions, because I let a computer pick the winner. Leave a comment here for each task you complete. If it isn't here, boo for you. 1. Leave a comment telling me your favorite celebrity encounter. 2. Visit Tri-C JazzFest on the Facebook. 3. Follow @TriCJazzFest and @ClevelandChick on the Twitter. 4. Follow @SheilaEDrummer on the Twitter. "I want @clevelandchick to send me to @TriCJazzFest! #TriCJazzFest http://bit.ly/1RQCX2B"
You can tweet once per day for additional entries, just leave a separate comment each time you tweet. Winner will be selected on Sunday, July 5th at 6 pm, so get tweeting! *Disclosure: The awesome peeps at Tri-C JazzFest asked me to help promote the event. In exchange, I was given 2 tickets to giveaway and 2 tickets for me. My opinions are all my own and my words are fueled by entirely too much hazelnut coffee. I visited Tri-C Jazzfest on fb. Meeting Van Hunt was my favorite celebrity encounter. One of my sisters had just seen him in concert a few weeks prior, in Atlanta; she had a chance to meet and talk to him and let him that our other sister, my daughter, and I would be going to his concert in Cleveland. In the middle of his show, he asked, "Are Shanna's sisters and niece here?" We screamed so loud! He told us to meet him after the show; we did and we got to take pictures with him. Teanna, you won! Please send me your full name and email address. Thank you for entering! Hmm. Meeting Mark Shapiro was always cool. Meeting Joanna Garcia was awesome too. That was the best day ever!!! No more comments while I let the computer pick a winner. Thank you! This was my second time attending an event at this place, and was my first business event here (the other event was a charity show). Everything at party places Miami was perfect, the drinks and food was amazing. Even the coffee was wonderful.